I did a post last week about our favourite kids’ outings in our neighbouring town, George. Our home town, Mossel Bay, a small town next to the ocean and mainly a summer holiday destination. Thousands of people come here to spend time near the ocean during December and January. 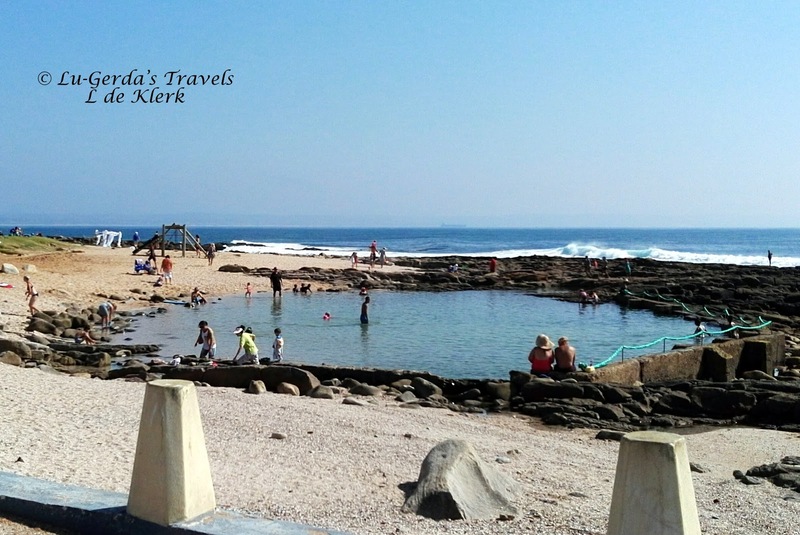 Mossel Bay’s main attraction during the summer month is the beach. And there is a lot of them to choose from. For toddlers and younger kids I would suggest the paddling pool at The Point (I usually take my son early, before it gets too busy and the sun to hot) or Santos with is small waves. For bigger waves rather try Hartenbos or Diaz Beach. 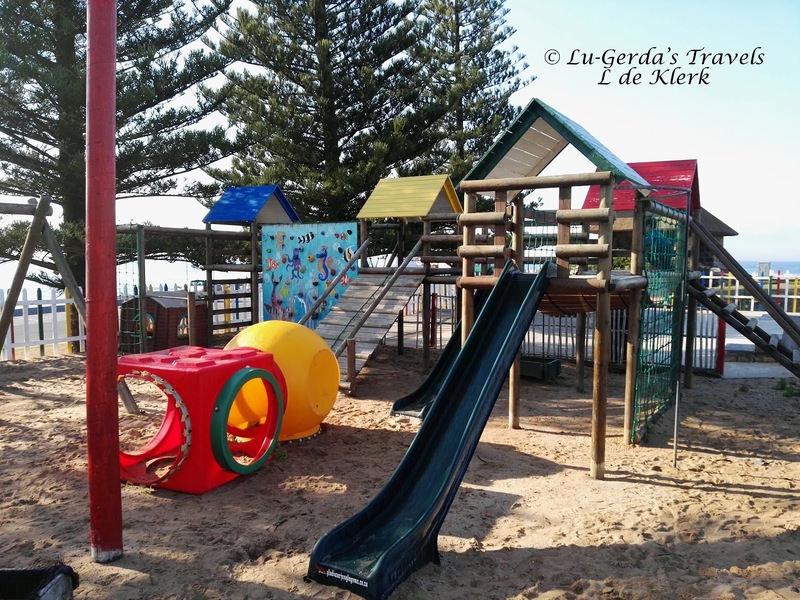 a huge jungle gym for climbing, sliding, swinging and lots more and adventure mini golf. The park entrance fee comes in different packages… only an entrance fee or including some or all the activities. There is also an indoor warm swimming pool (pay separately) and during holidays there are other activities like bumper cars etc. The Diaz Express consists of three restored Wickham railcars and they offer different excursions. I went on the trip from Mossel Bay to Maalgate with work colleges with a stop at the Transkaroo Restaurant for lunch. It was a wonderful trip with great views and food. During the December holiday they only do shorter shuttle trips between Hartenbos and Santos Beach. This shorter trip could be great for younger kids that get bored easy. These trips leave every hour from the Mossel Bay harbour and takes about 1 hour. The trip takes you around Seal Island with its ± 3000 seals and great views of the bay and town. I went on the Seven Seas Trip in 2015 and enjoyed is a lot. I want to take my son on this trip but he cannot swim yet. And even though it is safe and there are life jackets available, I think we will wait another year. Trips are dependent on weather conditions and remember to pack something warm to wear. You can book online for Romonza (R160 per adult & R80 per child). I could not find the prices for Seven Seas trips online. I love going to the Dias Museum and visit at least once a year. This year I took JW with me and he loved the outing. We started at the Shell Museum and Aquarium. Then we walked to the Post Office tree and played outside for a bit. There is lots of grass and some ducks at the spring. Next time I will pack a picnic to eat on the grass. Last we went to the Maritime Museum to see the replica of the Caravel. JW’s highlight of the day was to climb on to the caravel. He pulled on the ropes and climbed ladders and loved every moment. There are 2 ticket options…Including getting on the caravel (Adult R 40/Child R 20) or without (Adult R 20/Child R 5). The Harry Giddy Park is a lovely place for a stroll or picnic. There is Aviaries with lots of different bids and also lots of other animals to see. There are fountains and lots of paths for a walk. There is a playground for kids with a boat, swings etc. 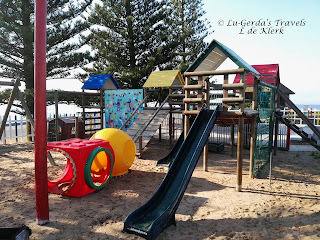 But on our last visit the play area was not in a good condition and needed a lot of maintenance. There is no entrance fee but you can leave a donation. The Shark lab is a small (very, very small) aquarium at the Point. JW loved the outing and to see the sharks. The entrance fee was R 20 per adult and R 10 per child (Children under 3 are free). There really is not much to see except for the 2 sharks in the tank and an octopus. I think it is too expensive for the 5 minutes you will spend walking through but JW loved it and that is why I include it on this list. I don’t know why we have not been here yet but it looks like a very nice place for kids to play. They have a large indoor jungle gym and a restaurant for the parents. Situated close to the Harbour in Bland Street is the indoor/outdoor restaurant with large braai. There is a play area for kids with a boat climb in. I recently went there for the first time for a breakfast and the prices look reasonable and the breakfast and coffee was good. Next time I will take my husband and JW with and try the lunch or dinner. I have taken JW to the cave and he loved running on the wood path inside. He wanted to walk up to the lighthouse but we will do this when my husband is with us. The cave is also the starting (or end) point for the 13.5km St Blaize Hiking trail. I don’t think the trail is suitable for young children but can be fun for adventures families with older children.